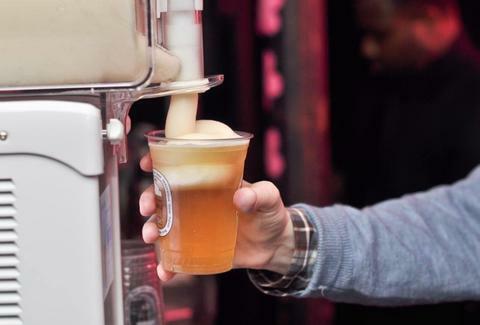 Rendering Snoopy's Sno Cone empire all but useless, Japanese beer company Kirin has released a home version of a machine that pumps frozen beer foam into your beer. The machine actually came out in 2012, but was only available in Japan and at Dodgers Stadium. Now it can be in your kitchen -- the Dodgers Stadium of your house -- courtesy of the Japan Trend Shop. This frozen-beer slushie machine was originally made as a Summer promo item for Kirin Ichiban beer, and proved so popular that it stuck around. Because it's still apparently 1999, the thing runs on C batteries, and to make it a challenge, the instructions are in Japanese. But for a cool $65, you can make all the frozen beer slush you want without risking the mess that comes along with putting cans in the freezer. Kristin Hunt is a food/drink staff writer for Thrillist, and is working on acquiring a straight-up slushie machine first. Follow her at @kristin_hunt.